This is a new type of float valve insert for the float bowl of the MkI Amal carburetors. Due to the slightly increased leverage, since the float needle in now positioned further away from the pivot of the float, the fuel inlet on the insert is opening faster and with better fuel flow. The only modification that is needed to be made is the fuel inlet hole on the bowl that needs to be realigned with the hole of the new insert. This is an easy job with the use of a 3mm diameter file. Inserts can be easily removed and inserted again with the use of the special drifts that we provide, and the appliance of heat to the bowls (hot air gun or boiled water). 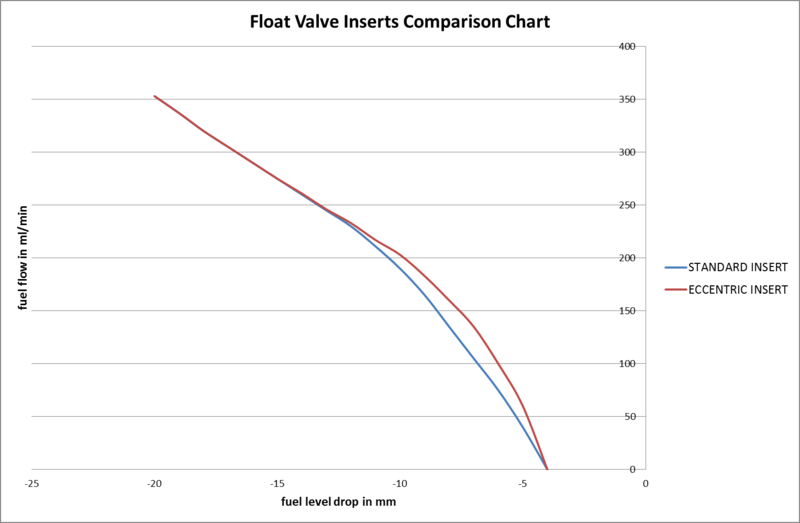 On the chart below you can observe the improvement that this new insert can deliver to the fuel flow. The fuel level is more stable at higher fuel flow/consumption from zero to almost 220 ml/min. and an aluminum body VITON tipped float needle, and these are the parts that we recommend.